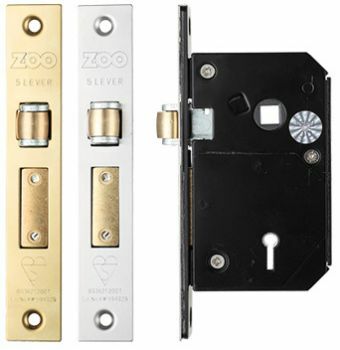 Replacement Chubb (now Union) 3K74 5 lever roller mortice sash lock by Zoo locks, certified to BS3621, as recommended by insurance companies and the police. Suitable for bolt through fixings (38mm centres). Roller latchbolt means lock is suitable for fitting in doors both left and right hand hung, without modification. Anti drill, anti pick and anti saw features 20mm deadbolt. Supplied with 2 keys as standard with box stiking plate and fixings. Available in 2 ½ inch (67mm) & 3 inch (80mm) case sizes. Locks can also be supplied keyed alike.